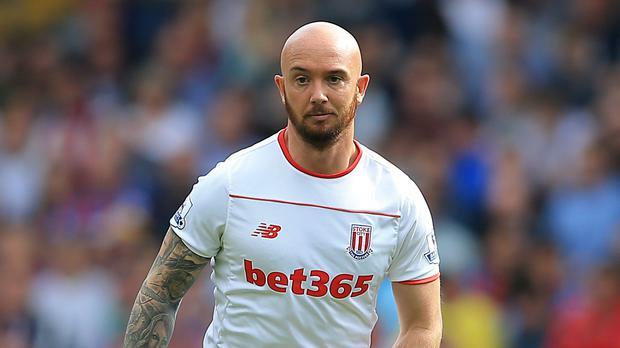 Stephen Ireland can remember the moment, with pin-sharp clarity, when his world was turned upside down. It was almost 20 months ago, on a spring morning during a training session at Stoke, five days before the end of the Premier League season when times were considerably better for manager Mark Hughes. Ireland went in for a 50-50 challenge with friend and team-mate Dionatan Teixeira and seconds later suffered the most excruciating pain, his left fibula and tibula completely shattered after an innocuous collision. Even now, as he prepares to make his first appearance in 609 days at Coventry in the FA Cup this weekend, the memories remain vivid. “I remember what happened as clear as day. It was a very relaxed session and in the last 15 seconds I was going for the tackle and nudged the ball off line and he [Teixeira] judged it wrong. “He kicked through with his heel on my shinbone. I heard it snap and knew instantly it was broken. I was hopping on my right leg and looked down at my left leg – the ankle and foot was like jelly, swinging. “I have quite a high pain threshold but this was something else. It was so gruesome. I’d have done anything to go back in time three seconds and pull out of the challenge. I knew it was going to be life-changing. Teixeira was sitting there, tears in his eyes and he’s now since passed away, God rest his soul [from a heart attack in November 2017]. Lifted off the training pitch at Clayton Wood by team-mates, he was already preparing for an absence of up to nine months. As he waited for the ambulance to arrive, for what seemed like an eternity, the day then descended into high farce. “What happened next was like something out of a film, it was crazy. The ambulance took ages. I was waiting, getting more and more annoyed because I just wanted the operation. “We eventually got to the hospital and the paramedic ripped me so hard out of the ambulance that I bit down on my gas and air and one of my front teeth fell out. “It was like something out of a cartoon, I saw it flying out of my mouth, out of the ambulance and on to the floor. I was escorted to a bed in hospital and asking for them to please find my tooth. He came back with a stone... I went mad. “They finally found the tooth under the wheel of the ambulance. I was struggling to lodge it back in. I was just thinking ‘what’s next’. Well, I was getting married two weeks later. The close support of wife Jessica, his two sons Joshua and Jacob, daughter Jess, plus Ireland’s agent Paul Masterton has been significant over the tough journey he has since endured. There have been frequent setbacks during the rehabilitation but he is now finally in a position to return, a remarkable story of courage, commitment and professionalism. Retirement was never going to be an option for the midfielder, who first made his name at Manchester City and was the club’s player of the year in 2009, complete with those Superman pants. He admits the time spent earlier this year at Aspetar, the renowned sports injury clinic in Qatar, was pivotal to his recovery. “I was supposed to be there for two weeks but ended up extending it to three months. I was in isolation and away from my missus and kids which was really hard. I went without a mobile phone for almost a year. I was training from 8 in the morning until 8 in the night. I had one day off out of every ten,” he says. The long, lonely period of rehabilitation was a difficult experience. “I’ve always been a determined person who pushes himself but I kept getting setback after setback. In my rehab I did my hamstring twice, my calf twice and my quad twice. They were harder to take than the leg-break. “I was close to playing a reserve game or completing a full week of training but kept getting a setback. You feel so close to the comeback and then you’re out for another month or two. It’s a vicious circle. Ireland, 31, also highlights the loyalty and support of Hughes, who was his manager at Manchester City when he produced arguably the best form of his career, and Stoke’s medical staff for helping him stay focused. He recently signed a new short-term contract and travelled with the squad for the game at Chelsea last weekend. But this Saturday at the Ricoh Arena could be the day when he finally pulls on a Stoke jersey again, his first appearance since May 2016. “You take it all for granted when you’re playing, being with the lads, the pre-match meal, the atmosphere in the grounds,” he says. “It means so much to me to be part of it again, it’s an amazing feeling. “I’ve been through a lot of hard times but feel I’m in the best shape I’ve been. I believe I could start a game now. I need some minutes to blow the cobwebs away. “The club have been brilliant and so supportive. The manager has been unbelievable too - I’m just praying he comes through this. Not to benefit me, but I know hard he works.